Welcome to another of my Food Series post! Back in December during mine and Rudy's little vacation to Los Angeles, we had a list of a few places we wanted to visit. This was the perfect time to check out new places around the Hollywood area because we weren't tied down to Disneyland like we usually are every time we're in town. One of the places I had been dying to visit was this very Instagrammable tea shop called Alfred Tea. If you are a fan of teas and everything covered in millennial pink like I am, then this is the place for you! The shop we visited was one of the ones on Melrose Place on Alfred Street. I found this cute illustration of the exact shop we went to over on their website. There are eight other locations in Los Angels, one in Texas and two in Tokyo. Alfred Tea carries a variety of teas to choose from such as traditional green and black tea, white, herbal, and premium teas. One of their popular flavors is the Matcha. Alfred also has a coffee shop which we didn't get to visit but definitely plan to the next time we're in town! The shop is adorable beginning from the entire exterior. 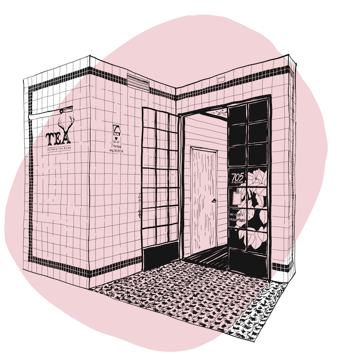 Outside the shop is tiled with pink and black tile and on the wall, it's painted Tea with the Alfred antlers logo. Right outside the door, they have a cute sign that reads "tea, yes. you, maybe." and I love this so much. Inside they have this phrase again but on a neon sign! I was obsessed!! The shop wasn't busy at all, there was only another group waiting for their drinks once we arrived. I ordered the rose milk tea (pictured at the top of the page) and Rudy got the jasmine tea. My tea was absolutely delicious which made me wish I ordered a large. I'm not the biggest fan of jasmine tea but Rudy adored it after adding some simple syrup. I really wished I got a better picture, but they even sell pastries and guess where the pasties were from? None other than Mr. Holmes Bake Shop goods! There are also so many merchandises for sale. Totes, mugs, teapots, teas, and cups. I was very tempted to purchase a mug but held back. The cups they serve our drinks in are so adorable! They're filled with different cactuses and succulent plants. I'm so obsessed that I made sure to wash them out and save them, I have no idea what for haha. They'll be perfect to reuse when I make my coffee at home and need to head out. Maybe? What do you think about Alfred Tea? Have you ever heard or been to it? Oh I remembered when you share this place on your IG story! I looks so cute, I love it and the tea sound delightful. I'll have to save this place on my map of places to visit. You will need to check out this place whenever you're in LA again. I loved this rose milk tea. It was adorable! Thanks for stopping by! I've always wanted to try Alfred's!! The vibe is sooo cute! You need to. It was so cute and the tea I tried was delish! Definitely want to go again and try their coffee. Thank you Lisa, and thanks for stopping by!